Come Together at CertainTeed. Build it and they will come! CertainTeed approached Brand Flights to create a new tool to provide their best Insulation Contracting Companies a place to hire qualified Insulation Installers. Brand Flights researched the market and created the branding strategy for Come Together at CertainTeed to connect with both Contractors and Installers in a fun a positive way. 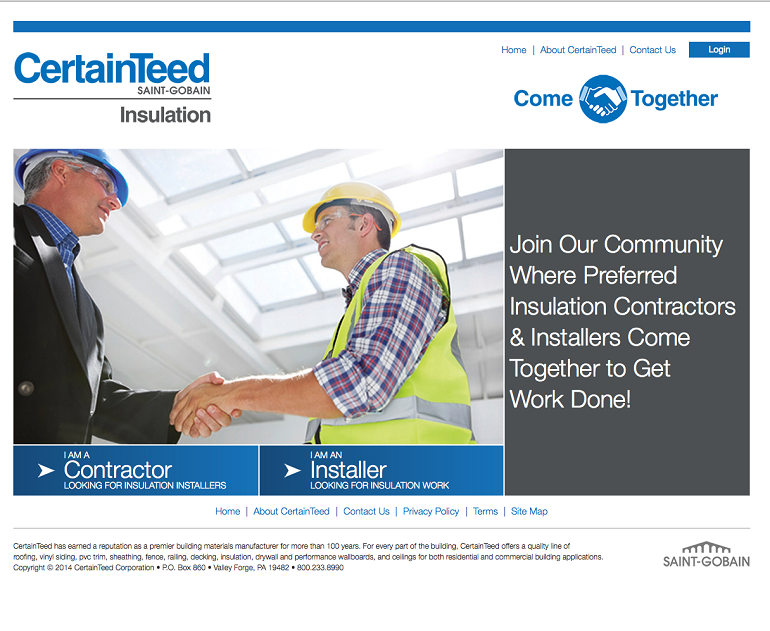 We created an elegant responsive design online job community for preferred Contractors to find Insulation Installers. This project spanned complete branding, design, site architecture, content development, SSL and login credentials for Admin, Contractors and Installers. We created simple search tools to easily find the most relevant Job, Installer and Company profiles. Brand Flights also developed an email alert system to notify job seekers of new positions that fit their skill and geography preferences, and alerts to notify Companies looking to hire new staff when qualified applicants create a new profile. Come Together: The Place Where Insulation Contractors & Installers Come Together to Get Work Done!